This post will make you very happy that you weren't a baby during this time period. 1916: Sleeping Porch. This was a proposed solution to the ever-growing city population problem. Made of iron and able to withstand 500 lbs, it does seem pretty sturdy…but does anyone else have “Rock-a Bye Baby” in their head right now? 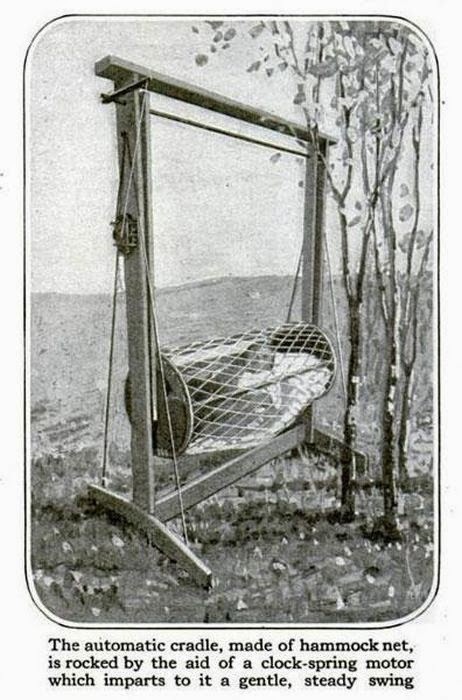 1917: Self-Operated Cradle. Taking care of a newborn is exhausting work and after hours of non-stop crying, you start looking for outside help. That’s exactly what happened to inventor Sheldon D. Vanderburgh who used a clock-spring motor to create this hammock for his new baby. 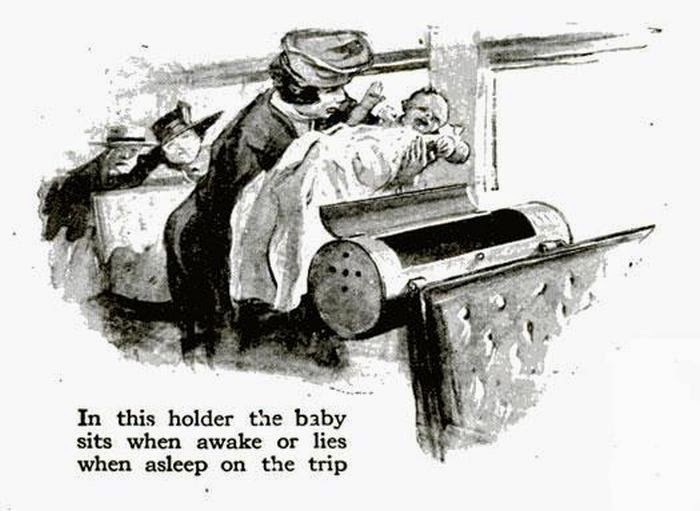 1917: Baby Holder. This invention was inspired by late night train rides where passengers were frequently plagued by crying babies. The inventor, however, didn’t quite follow instructions and it did little to muffle the sound. 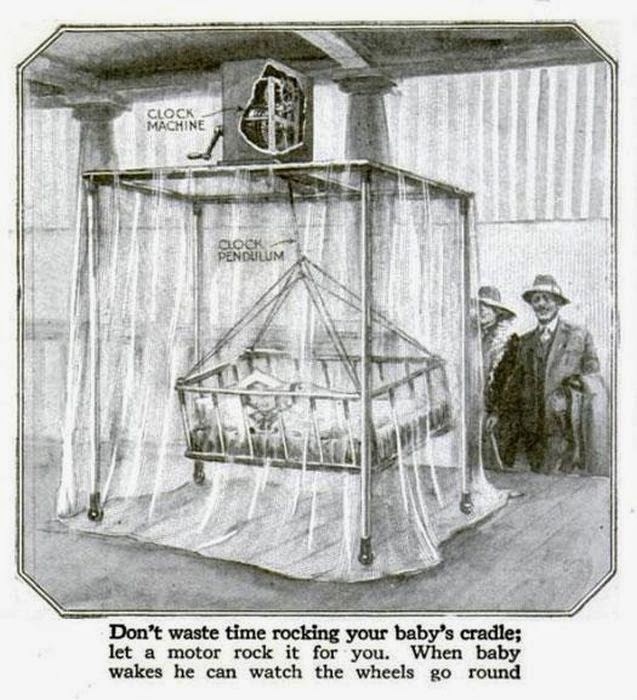 1920: Motor-Driven Cradle. No one seems to have the time to rock their child to sleep, so another proposed invention rose up with the added bonus of “entertainment” for your child when they woke up. 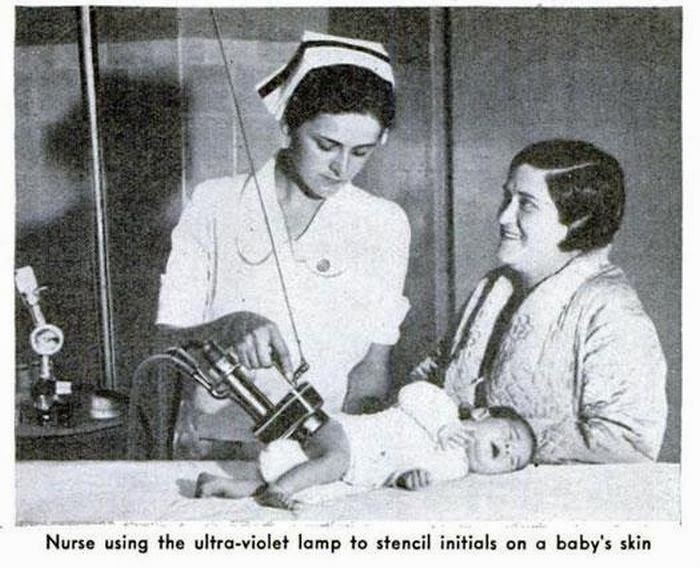 1934: Black Light Baby. 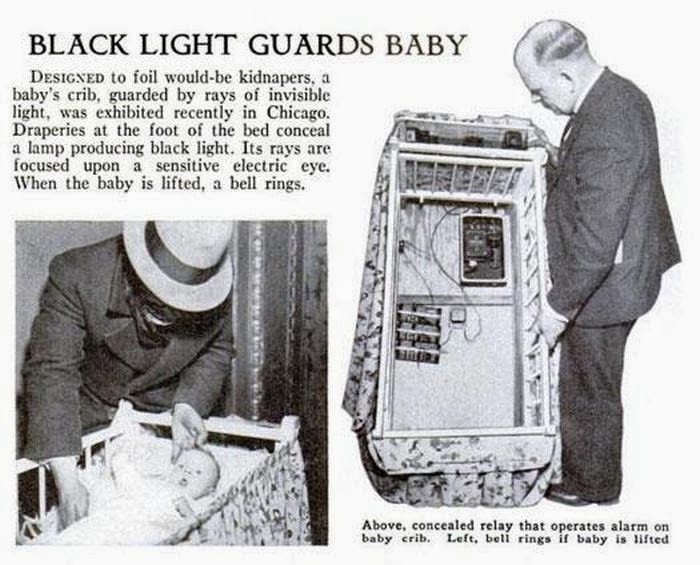 After the Lindbergh baby kidnapping shocked the world, inventors sought a way to keep children safe with this product. 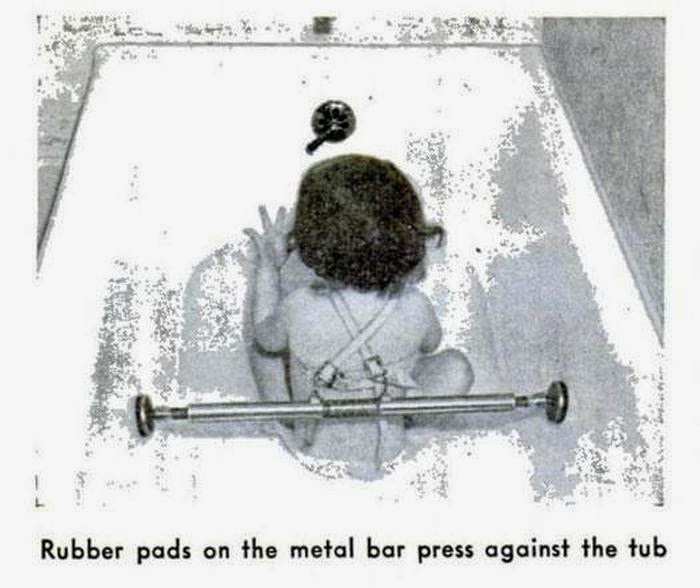 However, parents weren’t all that comfortable with that much machinery under their child’s bed. 1938: Baby Bicycle Seat. Take half a pram and slap it on a bicycle. Voila! A wonderful way to get exercise and air out your baby at the same time. 1938: Baby Gas Mask. 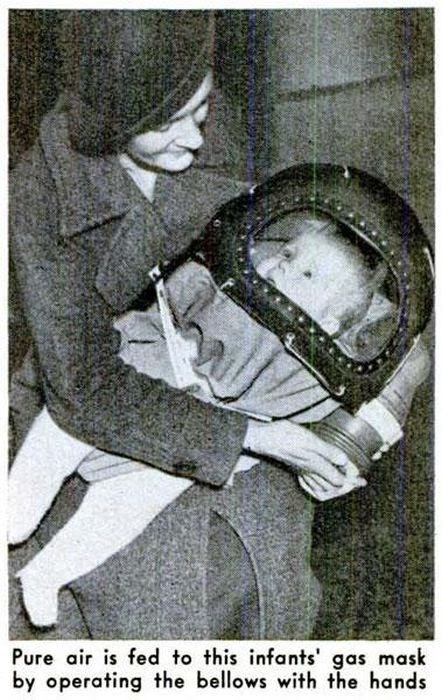 The threat of possible air warfare in Europe led French inventors to propose this solution for keeping babies safe. 1938: UV Lamp Brands. Hospitals would be able to use this to mark newborn babies with their initials in order to avoid any switched-at-birth scandals. 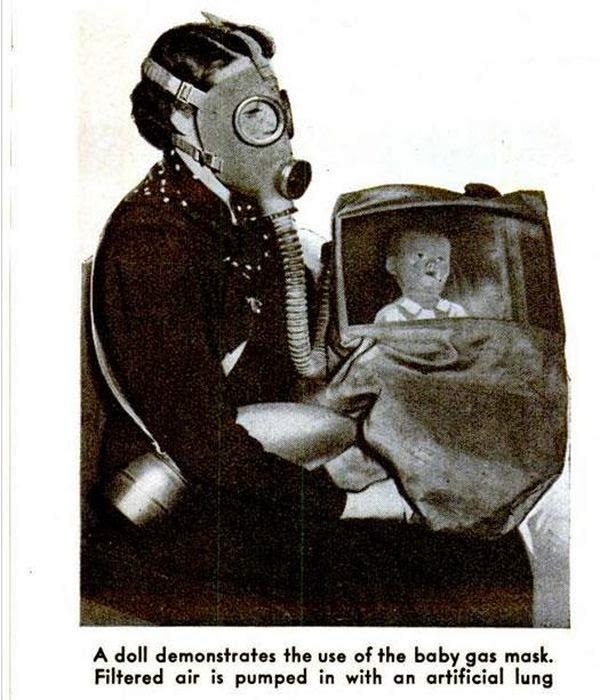 1939: Baby Gas Mask Upgrade. 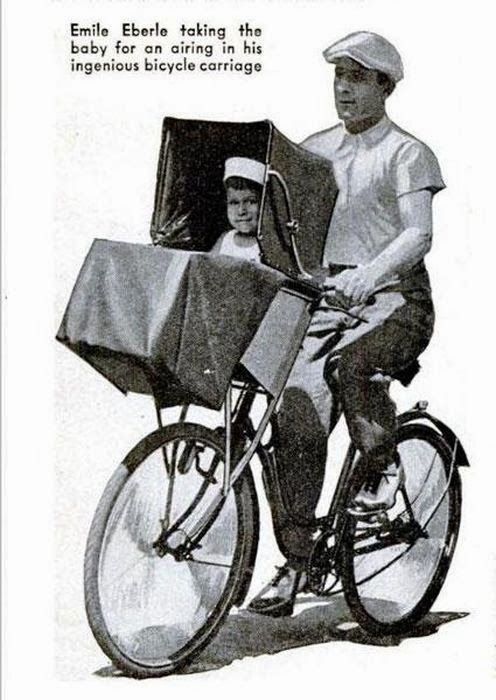 A month away from Germany’s invasion on Poland, this upgrade still allows for whoever is holding the infant to control the airflow but with a little more comfort for the kiddo. 1939: Baby Walker. 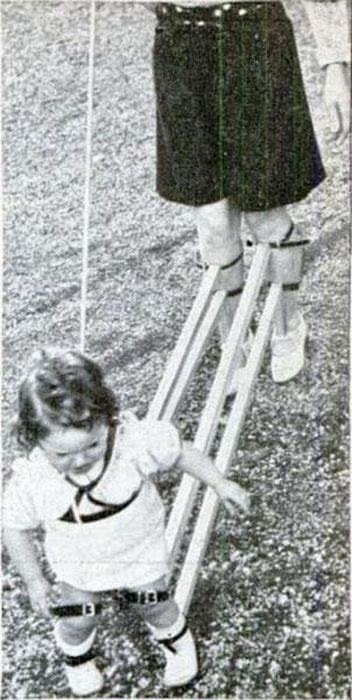 If guiding your child by hand on how to take their first steps feels a little too lovely-dovey for you, this invention could have been the solution. Not only are the child’s legs strapped in sync with your own, but a harness and leash allows you to keep them upright…From a distance. 1939: Safety Belt. This could be helpful for single mothers dealing with what to do when the phone rings, your other child cries and someone knocks at the door while you’re in the middle of bath time with the little one. Just strap ‘em in and go about your business. 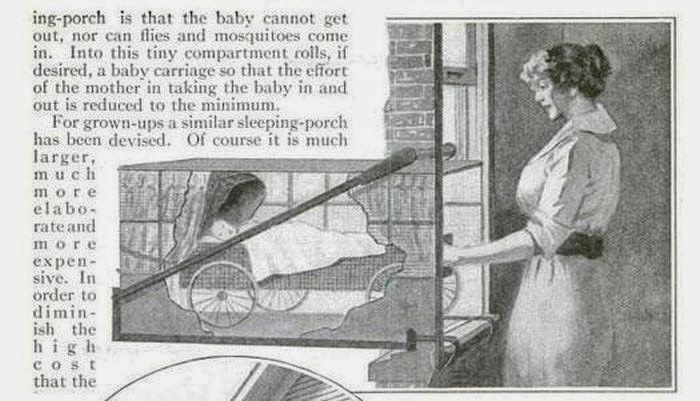 0 responses to "Creepy Inventions For Babies From The 1900s (11 pics)"